Stop the proposed Busingatha cableway in the Drakensberg! This petition has been created by Amagug’esizwe P. and may not represent the views of the Avaaz community. “Our name for our mountains and our culture is Amagug’esizwe (Treasure of the Nation). 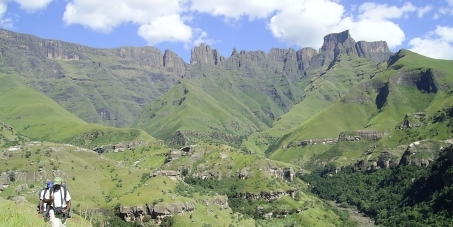 The mountains of the AmaZizi and the AmaNgwane lie between the two sections of the Maloti-Drakensberg World Heritage Site. One day we hope that our mountains can also be a world heritage site – a Living Cultural and Natural World Heritage Site. For many years we have worked towards identifying a community-managed nature reserve with a wilderness area. “My name is Sigungu Miya, brother of the late Nkosi E.M. Miya of the AmaZizi. I speak on behalf of the family of the recently deceased Nkosi Miya, as the traditional leadership of our people. We have not been able to speak until now because we and our community have been in mourning for our Inkosi, his children and his brother. The cableway is not desired by the AmaZizi leadership and many community members, nor have they been properly consulted. The Busingatha Valley, and other valleys surrounding it, is home to the AmaZizi. Together with the neighbouring AmaNgwane leadership, and following years of consultation, there was consensus that 45 000 hectares of land would be committed to a community nature reserve and wilderness area. A proclamation process for this nature reserve had just commenced when the cableway proposal was launched by a provincial MEC. The cableway and its associated large-scale tourism facilities would invade on land in the heart of the anticipated community wilderness area, which is imbued with profound ancestral and cultural connections. It would also disrupt the cultural and societal fabric. The cableway would jeopardise the integrity of the World Heritage status of the surrounding areas of the Drakensberg. It would also destroy the opportunity to create an unbroken protected area covering close to 300km of the Drakensberg range. The cableway and its associated infrastructure will harm the environment and have cumulative and irreversible impacts on the mountain and its wilderness. The economic viability of the cableway is highly questionable. Earlier proposals of Drakensberg cableways have never convincingly demonstrated viability – this one is no different. Furthermore, community wilderness groups have employed far more people in their programs than the current proposal promises to deliver. The local community should rather be assisted in establishing the nature reserve and wilderness area, and to ultimately achieve the World Heritage Status they desire for the Treasure of the Nation. They should also be assisted in developing two possible sites where large scale tourism developments like hotels can be built. These sites are outside their wilderness boundary and the development would have no negative impacts on the wilderness area.